A man who was sexually, physically and emotionally abused at an industrial school as a child has gone on a two-week hunger strike after he claims survivors are "ignored". William Gorry (52) has claimed that survivors are made to feel like they should "be quiet and appreciate what they're given" by the State. He also claims they are being failed by Caranua - a State body which gives financial support to people who were abused in residential homes to help with things like housing, education, medical needs or counselling. There were thirteen children in William's family and he grew up near Daingean in Co Offaly, his life was turned upside down when his mother left when he was nine-years-old. He told Independent.ie: "My parents were loving and did everything they could for us but eventually my mother just couldn't cope and left the house. "I remember we had no running water, no electricity, my father was trying his best to keep us all together but instead of providing support the Midland Health Board took us into care." Along with two of his brothers and three of his sisters, William was sent to Mount Carmel industrial school in Moate, Co Westmeath, which was run by the Sisters of Mercy. He claims: "Sometimes it was okay but mostly it was Hell, I was emotionally, physically and sexually abused over the years. "We would get beaten by priests, lay staff and nuns who were supposed to care for us. "We were screamed and yelled at, I was told that I was useless, stupid, blind and hopeless, nobody would love or want me. "I was humiliated, the way I was spoken to or about. The way they spoke to my family visitors and about me to them. "I was isolated to confined space and often punished severely. "Many times I got slapped and boxed across the face, I remember being locked in a hot press in darkness for hours until I was bruised and blistered." He has also spoken candidly to Independent.ie about allegedly being abused throughout his childhood by school staff, clergymen and other students. William finished school when he was 16 but returned as he "couldn't cope with the outside world" for years of after-care and left for good when he was 20. William, who now lives in Dublin, opened up about the devastating impact the abuse has had on his life. He said: "It's affected me emotionally, I feel like it's stopped me from doing a lot of things and I've quite a lot of unhappiness in my life. "I find it hard to form friendships, getting close to people and trusting them is hard, I feel like I'm always watching myself. "I haven't been able to move on or have a life of love and happiness, it's like a tension inside of you and you're just supposed to be happy with what you have." 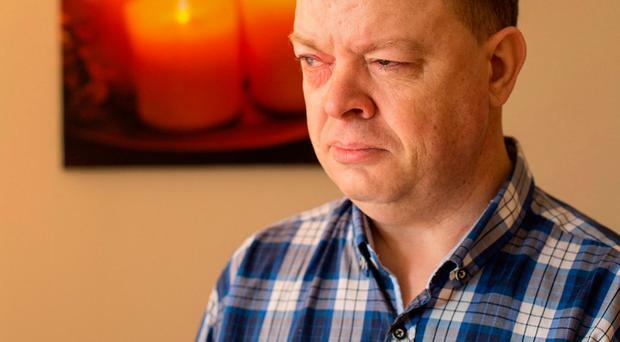 William has been unable to find work and survives on a blind pension as he has a severe vision impairment. He said that he received help of over €36,000 through Caranua but is unhappy with how they are run, particularly with their CEO Mary Higgins, who referred to abuse survivors as "damaged" earlier this year. Ms Higgins has since withdrawn her comments but William says he won't be happy until she steps down. William said he was so hurt by her remarks that he returned his payment to them earlier this month by taking out a loan. He said: "I find that Caranua can be judgemental to abuse survivors. "Ms Higgins' remarks also felt too deep, yes we're damaged and even more damaged and re-abused, it brought up a lot of bad memories." William went on hunger strike earlier this month to highlight how distressed he is with the level of support given to abuse survivors here. He said: "I feel like you have to go through so much and I'm not able to move forward with my life. "I've written to the Taoiseach to see if I can arrange a meeting with him about this, I haven't heard anything back and I think that shows the State doesn't care about me or survivors. "I feel all my life I've been trapped by the State, I've been silenced and told to be grateful for what I get, people don't realise what mental torture this is. "I feel I got forced to a point of having to go on hunger strike to show what I've been through." He began his hunger strike on July 10 and called it off after two weeks after meeting with the Department of Education regarding his issues and suggests that survivors need to be able to meet each and to express their concerns in a safe and fair environment. He said: "I want people to have somewhere that they feel comfortable talking about things, that would be good for them. "I think survivors have been ignored for too long and it's about time we didn't feel gagged." A Spokesman for Taoiseach Leo Varadkar told Independent.ie: "It's not appropriate to comment on individual cases due to client confidentiality. "This Department has received correspondence regarding a particular case involving matters which fall under the remit of the Department of Education and the Department of Social Protection. "The Department followed appropriate procedures and asked officials in the Department of Education and the Department of Social Protection to contact the individual concerned at the earliest opportunity. "That contact has been made and an offer of further assistance has been made." A representative for Caranua said that legislation "prevents Caranua discussing any details about an applicant or potential applicant with a third party without their written permission." Is William still on hunger strike. ?